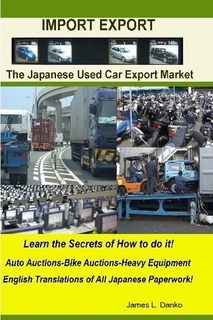 'If it exist we have it or can get it"
For More Information on Doing Business in Japan Read the “Import-Export Business Secrets of the Japanese Used Car Export Market” Book. Its loaded with interesting Information. The management team of Yokohama Motors is an interesting group. James heads the team along with his counterpart Mr. Kimura (hammers out leaf springs with his bare hands). The rest of us just sit back and watch the fun. Corporate meetings are held at Base Camp Fuji, BBQ and plenty of Jeeps…Jeeps, and 4WD fun. There is also the bosses famed 69 Z28 that rumbles Fuji. Car company run by car guys (and girls too). Most people come to us after getting the runaround and countless problems with other so called suppliers. They either do not have the parts or cannot get them. If you too are experiencing problems come our way. With a Global Dealer and Repair Facility Network of over 140 Corporate Customers and growing we can supply exactly what your require with speed and ease. We look forward to the opportunity to add you to our network whether you are a large or small group; we can handle your needs. Since we Specialize Only in Parts we have the knowledge you need to find the right components for your vehicles. We support both Parts for Cars & Trucks, new and old. Join our network today. We have what you require. Along with dozens of Quality Japanese Aftermarket Parts Manufactures, we have what you need.